Get banking access on your phone wherever you go! Beacon’s mobile app is a secure product intended to make banking more convenient for you! Instant Account Balance – see your balances quickly without having to log-in! Touch ID – log-in using your fingerprint. How do I get the NEW mobile app? Click on the Account Services Tab on the right side of the screen. Click on the Request tab on the left side of the screen. Enter your mobile phone number. Register the device and select the type of device you are using. A text message will be sent to your mobile phone with a link that will direct you to download the My Beacon Mobile app. Do you have a tablet? 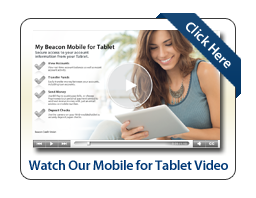 Download the My Beacon Mobile for your tablet app. 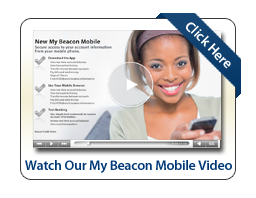 You have access to all of the same features as the My Beacon Mobile app plus more! Check out the video for more info. Want Text Banking? We have that, too! Text Banking is the quickest and most convenient way to check your account balances and recent transactions – anytime, anywhere. All you need is a mobile device that has SMS Text Message service enabled and you can register to use our Text Banking service. Sign up for Text Messaging access by logging in to your Beacon Online account – be sure to register from a desktop computer. Visit the app store to download the My Beacon Mobile app and the My Beacon Mobile for your tablet. Now that’s banking on the go! To access account information you must be enrolled in Beacon Online. Not signed up yet? Enroll in Beacon Online today.